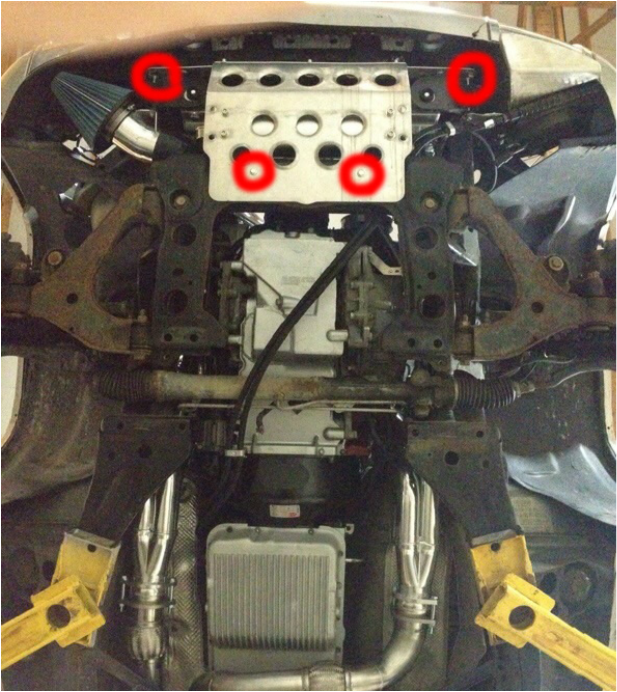 Shown to the right, circled in red, are the 4 mounting locations for the accusump mount/ skid plate. The front two points of the skid plate that are circled in the last photo will mount by being "sandwiched" in between these two stock mounting points behind the front bumper. As a reference, to the right of my finger is the factory radiator to frame mount. To the left is the factory lower bumper to frame brace. The skidplate will slide in between these two stock mounts and by reusing the stock bolt the skidplate will be "smashed" between them. Shown here, by the red arrow, is the rear mounting location of the skid plate. There are two holes in the bottom of the frame at this location that are already threaded to accept the included M8 Stainless steel mounting bolts. If there is rust in the hole I recommend cleaning it up by threading in a tap to clean up the threads. At the very least you should at least put some type of lubricant on the bolt before running it up to prevent damaging any threads. 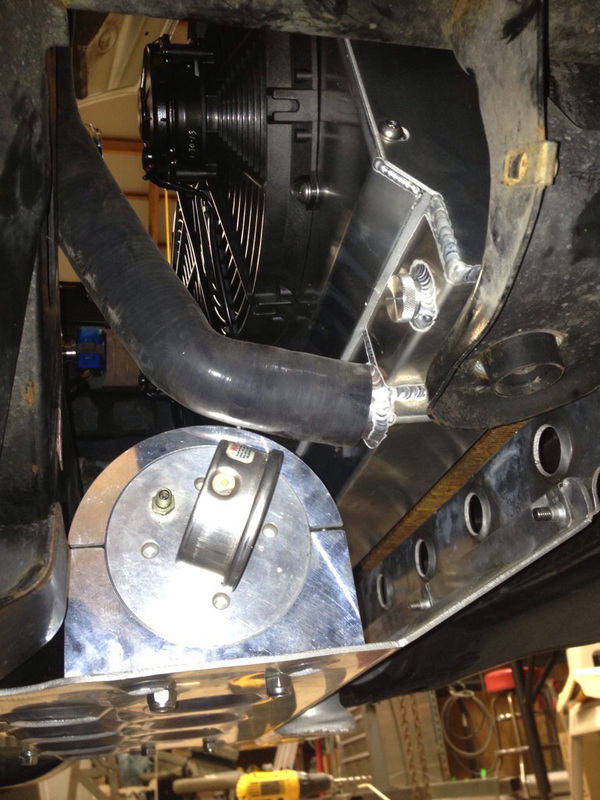 Here is a close up view of the rear mounting points where the skid plate will bolt to. Now that the skid plate is mounted it is time to bolt on the billet accusump clamps. Use the provided 5/16" Allen head stainless steel mounting bolts, nuts, and washers to fasten the clamps to the skid plate. You can then clamp the accusump accumulator into its mount and tighten both sides of the billet clamp evenly. This should conclude the mounting of the skid plate and accusump accumulator. If you have any questions or problems during install please call Scott @ (708) 691 2613.